As the Internet world is progressing, new and modern opportunities are coming into the field of online money making. Online Translation Jobs is also one of the emerging and top earning source for freelancers. You want to earn money online. But you don’t know exactly how to utilize your translation skills. I am sure that you have read the title first. That means you can fluently use at least two languages. And, you want to make money by being a translator online, don’t you? 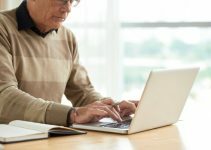 In this article, I am going to list out a few genuine websites, using which you can grab some online translation jobs. I admit it! The web is a broad place, so broad that both genuine and scam are intertwined together. And, it is literally impossible for fresh eyes to distinguish between scam and good options. So without further ado, let’s get into the list of sites. Unbabel is a professional community of translators. As of now, they have managed to get 40000+ translators all around the globe. And, it supports 28 languages. Once you find out the languages you know on Unbabel website, you should join as a translator. For a beginner, they pay about $8 per hour. As you grow as an expert translator, you can even get $18 for an hour. One of the best things about Unbabel is it gives you the source and an AI-generated piece of translation to help you with. And, you don’t have to wait until the end of the month to get paid because they follow a weekly payment pattern via PayPal or Skrill. The company has made the job so much easier with their mobile app. You can translate on-the-go using it. Quick Note: Chinese, Spanish, Japanese, & Arabic are the most requested and highly paid languages throughout the World. 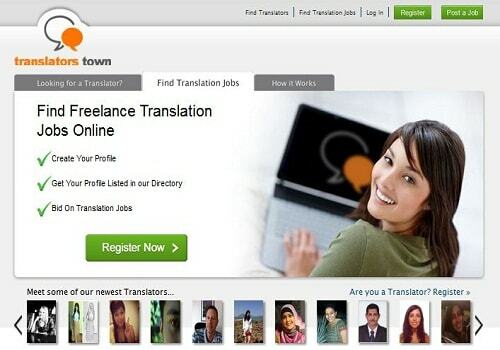 Translator Town is a perfect place to look for a translator job online. It is global translation job portal, which connects clients with translators and Agencies. Just you have to post your Translation Job, and you can easily earn money translating online. You can also hire Freelance Translators and Translation Agencies without any trouble. Basically, it is a freelance translating network. Start by registering yourself and creating your profile with the correct information, if you are applying for Translation Jobs. Now they will list your profile into their directory for bidding on as Translator Jobs. Once you become a popular translator by delivering commendable works, clients will directly contact you with work. Translatorstown also allows you for that and that’s why it’s one of the best online translation website. Unfortunately, the bidding option is not available for the free members. You have to be a paid user to get all the features. One disadvantage of using this website is it never stands between you and the client as a channel for the payment transfer. They want you and the client to negotiate the price and transfer it outside their site. Translator Base is also one of the leading translating online services. It has the network of globally high quality translating jobs portal. By the help of this service, you can take your business to the next level. There are 4 services provided for translators and translation agencies. 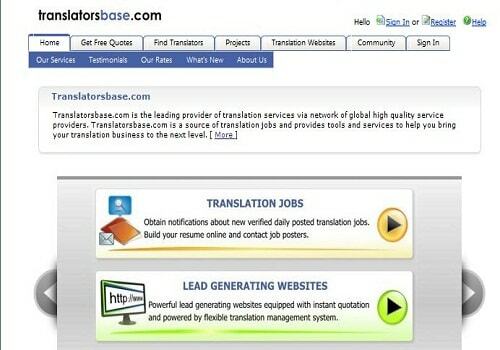 Unlike the previous website, Translatorsbase is a large platform with well over 600000 translators. According to their site, they have 78000+ clients with 85000+ projects and making from translation is just a register away. TRADU guide is also a good platform for finding translation jobs. It is a convenient platform for freelance translators, translation agencies, and their clients. TRADU guide also helps you to find translation service provider. TRADU guide’s main strategy is to provide its users with access to a truly global translation network solution. 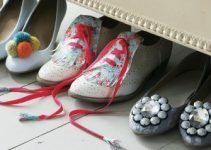 On the home page, you will find the latest work listed for the language support. You can monitor it 4 times a day and send your portfolio as soon as you see the opportunity. So this is again a vital platform to make money translating online. In a study of more than 1000 respondents, the most common areas of language specialization reported were business/finance (57%), law (55%), medicine (47%), and information technology (38%). Uncommon areas of specialization included entertainment (18%), natural sciences (16%), and pure sciences (8%). 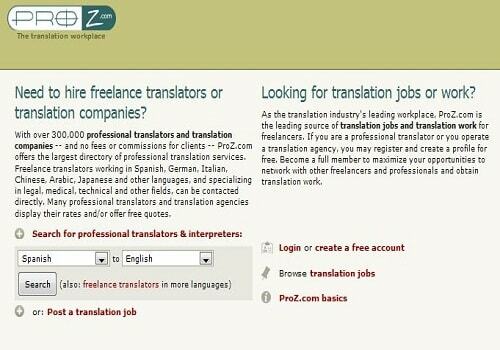 ProZ is also said to be a translation workplace, which hire freelance translators and translation companies. There are over 800,000 professional translators and companies available for serving your purpose. The good thing about ProZ, it takes no fees or commissions for clients. It can also be said as the largest directory of professional translation services. The registration process is simple and straightforward. You can easily create and register your profile for free here and maximize your opportunities to make money with translation online. 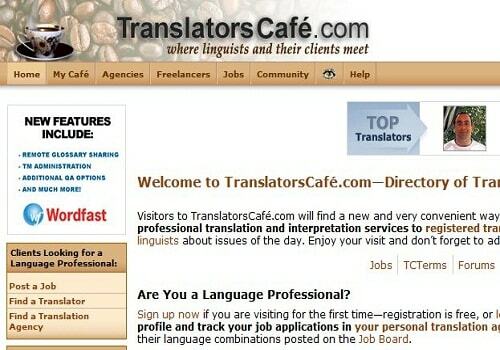 Last, but not the least in this list of best online translation jobs sites is TranslatorsCafe. The working principle is the same as that of all the other translation marketplaces. You can take a free membership. And, there is a master membership option that gets you better exposure once you take it. Basically, it’s a community of translators, language professionals, and interpreters where you need to submit a resume and cover letter to help the employers figure out whether you are eligible or not for their work. TranslatorsCafe doesn’t block direct contact methods like email address. So, you can even settle the deal outside the platform and can start online translation job from home. What do you think? You have got a new method to earn money, sitting at your home. If you have some time, I will recommend you go with all the five sites mentioned here. You can earn more by delivering multiple works at a time. So, what are you waiting for? Head over to these sites, register, and start working right away. Do let us know your experience with each of these sites in the comment section below. This is really cool. It will be a great for those translators. I’m not a translator in anyway. Wow…..its really a great choice to earn money online, as India is a rich country in having different cultures and languages so Indians are really lucky….but I have to clear a doubt. Vivek can we apply in these language translators for translating Indian languages to English or Vice verse or these websites only support languages like french, German etc…??? Please tel me know about my doubts conclusion. And very much thanks for understanding the content in depth. In my opinion these are largest platforms in the world for translations. Thus obviously they must be support for Indian Languages also. In other ways, India is also one of the biggest and developing country. There are many people who have very deep knowledge about French, German etc. SO they can easily utilize these platforms for making quick money online. am sonali datta from india. have done post graduation in english literature and have learnt spanish for 5 years ( passed dele b1). would like to be a professional translator. sir, would you please help me to serve my purpose ? a positive reply will make me grateful. my cv is attached herewith. I’ve been translating for the past 20+ years and, while I managed to find some work on those forums, I found the best way to enter the industry is by approaching as many translation agencies as possible. Most agencies only post job offers on those forums when they need a specialist they don’t already have, or have too much work or a large project and need to find and test more translators. 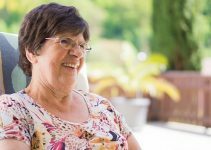 Most of their work though they will assign to translators who are already in their database and have applied and potentially tested. You just gotta go through their process, but it pays in the end. Hi Karel! I just want to ask you if want website or translation agency did you join? Thank you. I was very surprised about this website in that I was sure that a translation website would have someone who knew more advanced levels of English grammar. Now, I know india has been very good with regard to English and that is understandable seeing as it used to be part of the now dead British Empire, but this website needs a professional translator for the explanations it contains. I don’t want to nitpick, but I felt it important to mention if other translators want to find work online then coming on here would constitute an error. No one will trust a site where the text needs fixing grammatically. It’s good to see your interest in translation jobs. You should try these sites for sure to earn money online. I am realy interested to this translation website, because i am a filipino and i love making translation of any language. Keep in touch with us for more translation jobs updates! I have done English to Bengali translations in the past. I would like to take up part time online assignments for #translations from English to Bengali, if available. I am myself a Russian Translator and have expanded my business into other languages also through making groups of translators. I invite all those, who are interested in cooperating and getting good rates, to contact me. I’m from Tanzania fluently in both English and Swahili language, i have been looking for jobs to translate English to Swahili i didn’t got any! do you know any site or where i can get a translation job Enlish to Swahili or Swahili to English? I am a proficient Malay to English translator. Kindly contact me if there are any online jobs available for freelancers like me. I m a post graduate in history and a textile designer. Teaching English for 10 yrs. .Would like translation jobs Hindi to English and vice versa and editing too can be undertaken. You have also failed to mention that PROZ.COM, TRANSLATORS’TOWN.COM, TRANSLATORSBASE.COM & TRADUGUIDE.COM invariably charge a hefty membership fee to enable you to bid for jobs. The sites mentioned by me either offer free membership or provide additional premium paid membership with special benefits. I’m surprised at your simplicity and innocence. On the internet translation job market one has to make lowest possible bids and work like slaves to be able to earn paltry sums. At least this is my personal experience. Wish you all good luck. It s good yo know that you have to pay to get translation jobs. Don’t think it’s free. I,Ashesh Trivedi, from Ahmedabad City, State-Gujarat, Country-India. I like to get online job for translating from English to Hindi or Gujarati Job. I am applying from my company’s Computer., but also having Computer @ home. I can use my computer @ home on Sundays only or Public holiday when our office is closed. Kindly guide me how to earn money with Free Registration & what is requirement of yours. I am agree we can make money online but have to learn some skills and spend some time for it and there is no shortcut for success in any field or profession even online or offline. Iam grateful to see this chance. I want to know if Kiswahili is among the languages available in unbabel professional community of translator. I want to join by translating Kiswahili to English and vice versa. Not sure if they provide freelancing work in Kishwali Language. But You always sign up here https://unbabel.com/editor/signup and get the complete info. I will provide a guide so that you can easily do this job with accuracy and also in less time. it’s not a quick hack but it’s a help to those who really required to be helped. I doubt that any of above websites will pay through Western Union. But you can individually check the websites and read the FAQ’s that will detail about all the payment options. We have already mentioned a complete list of website that you can go with. They all are legitimate and numerous of opportunities are there to start. This is cool. I also found out that you could make as much on Zuma Investment. Try them out and be convinced! I am really interested to this translation website, because i am a filipino and i love making translation of any language.